Discover the reasons why you should be seeing your Charlotte family dentist more often. Has it been a while since you’ve seen your Charlotte family dentists Drs. Susan Hockaday and Jim Baucom? You might even be wondering why you need to come in every six months for cleanings when you can just as easily brush you teeth at home. Find out the importance of routine dental care and why you shouldn’t skip it. Checking for decay: Did you know that about 92 percent of adults between the ages of 20 to 64 years old have had cavities? While this percentage is startlingly high, it doesn’t have to be this way. In fact, cavities are completely preventable with the proper care. While brushing twice a day and flossing daily will certainly get you on the right track to a cavity-free smile, you still need to see your Charlotte family dentists at Hockaday & Baucom, DDS, every six months for a more thorough cleaning and to pinpoint decay before they become full-blown cavities. Detecting gum disease: It is predicted that about half of the population has some form of gum disease. 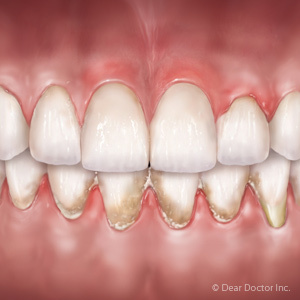 If left untreated, this chronic condition can cause tooth and bone loss. The best way to prevent gum disease from happening to you is to see your Charlotte dentist for regular cleanings. Even if you are a great brusher, it’s still common to miss spots every once in a while; however, if plaque isn’t removed it can quickly turn to tartar, which your toothbrush just can’t remove. The only way to get rid of tartar is by coming in for your biannual cleanings. What happens if you leave tartar on your teeth? This problem will eventually lead to the beginning stages of gum disease. Discovering other issues: Beside the common dental ailments like cavities and gum disease that befall many people, there are some less common problems that your Charlotte family dentists Drs. Hockaday and Baucom can still detect through a routine exam. For example, we can look for signs of oral cancer, infection or jaw problems. With an increase in the prevalence of oral cancer, it’s now as important as even to see us routinely for your dental exam. Needless to say, it’s vitally important that you see your Charlotte family dentist routinely for dental care. No matter how well you care for your teeth at home, you still need to come see us every six months. You don’t know what could be lurking in that seemingly healthy smile. Schedule your next appointment today at Hockaday & Baucom by calling (704) 553-2348.